When I travelled all around Thailand a few years ago (almost 10 yrs ago now!!!) with my husband I think I must have had Chicken Satay at almost every restaurant! I really love it! I found it quite different however to the Western versions that we are used to here in Australia. Everything is sweetened up a little more over here! 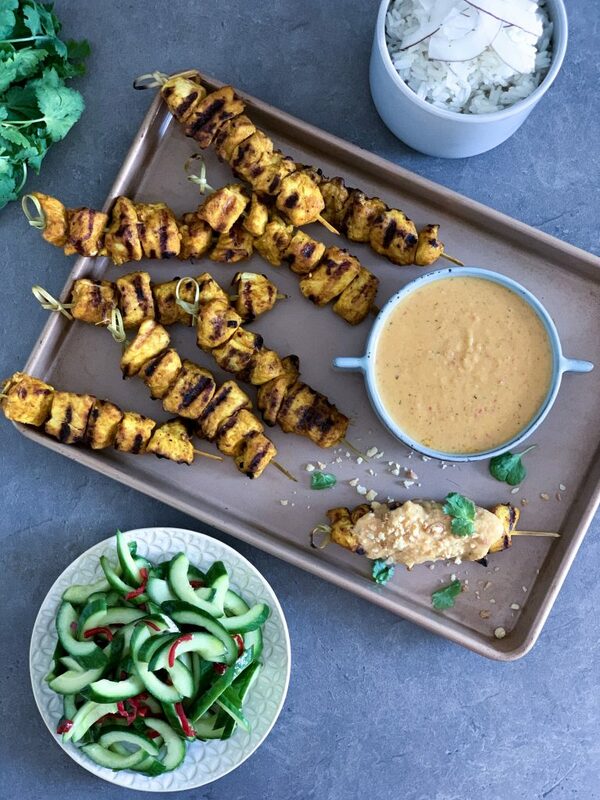 This satay sauce version of mine I developed when I worked fulltime at the health retreat. As we don’t use peanuts at the retreat, I made it with macadamias as a replacement for the peanuts! And it’s amazing!!! Peanuts a tendency to soak up aflatoxins from fungus in the soil. This is rather questionable. Being from the legume family and not really a nut, they have quite a porous shell, making them more susceptible to soaking up pesticides and bacteria as well, just one reason why organic is ultra important. Of course, we also know of the scrutiny they receive for being so allergenic too! We don’t have any allergies in our family, however they are not something we eat very much of – more on the occasional side! If we do have them, they must be organic peanuts! 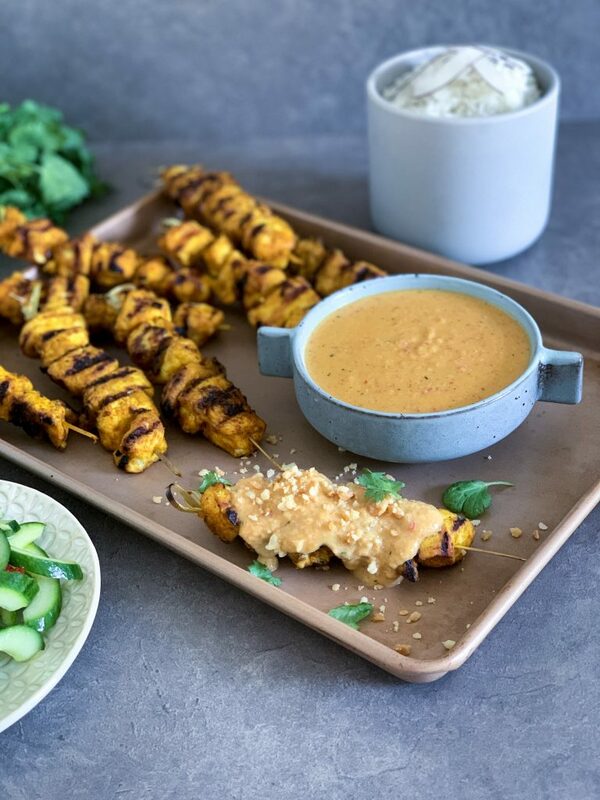 And saying that I’ve recently developed the best Satay Sauce using peanuts more specifically for Vietnamese Rice Paper Rolls! This satay sauce sauce as I said above, has some of what I would call Malaysian flavours, but I still use coconut milk, more like the Thai version rather than soy sauce. The marinade for the chicken is super easy and just flavours that meat up a little more than just leaving it plain. I use chicken thighs as I find them more flavoursome, however you can use chicken breast or tenderloins, but just remember to reduce the cooking time to about 2-3 minutes each side. You can serve this dish traditionally with Cauliflower Rice for a lower carb version, or just as they are with the sauce with and the cucumber pickle! 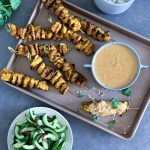 Delicious peanut free satay sauce! Chop the chicken into 3-4cm cubes and place into a large mixing bowl. Place the eschalots, garlic, spices, salt and olive oil into the Thermomix and chop 5-10 Sec/Speed 7. Add to the bowl with the chicken and stir to combine well. Let marinate for 4-6 hours or overnight. Thread 5-6 pieces onto medium sized skewers. Preheat a chargrill or barbeque grill on high. Cook the chicken for approximately 4 minutes each side or until the meat is cooked through evenly. Preheat the oven to 180°C. Line a baking tray with baking paper and roast the macadamias for 10 minutes or until golden brown. Remove from the oven to cool slightly. Place 50g of the macadamias into the Thermomix and chop 15-20 sec/Speed 4. Set aside. Place the remainder of the nuts into the Thermomix and mill 10 Sec/Speed 9. Scrape down the sides of the bowl then process 40 Sec/Speed 4-5 until nut butter forms. Set aside. Place the onion, garlic, chilli, lemongrass and olive oil into the Thermomix and chop 10 Sec/Speed 7. Then sauté 10 Mins/100°/Speed 1. Add the all the remaining ingredients along with the reserved nut butter and cook 5 Mins/80°/Sp 1. Once cooked pour into a serving bowls and sprinkle with the reserved chopped macadamias. Serve with coconut rice or Cauliflower Rice. Serve with my Cauliflower Rice for a low carb version! You can double my Coconut Rice to serve more people. This entry was posted in Entrees, Ketogenic, Lunchbox, Mains, Paleo and tagged Chicken, Ketogenic, Macadamias, Paleo, Satay. Oh Gabrielle, these were delish TFS. Hi, I’m Gabrielle! Welcome to my Kitch’n Thyme! I’m a Mum of 3 beautiful babes, a Chef and I love to cook! 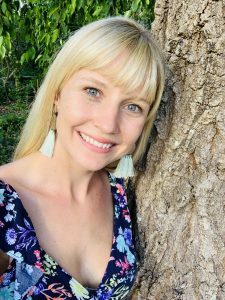 ~ I was a homebirth! ~ I grew up with a health freak mum – lots of tofu cheesecake and banana icecream! Thanks Mum! ~ I have a small obsession with growing and eating heirloom tomatoes!